Any substance which allows the flow of electric current through it is known as an electric conductor. However, the term conductor is specifically used for solids and the liquids possessing the similar sort of properties are more appropriately called as electrolytes. Going even deep into the basic definition of electrolytes, these are actually ionic compounds which break down into charged ions when electric current passes through them. Ionic compounds are usually solids and cannot conduct electricity, as there are no free electrons for the conduction purpose. 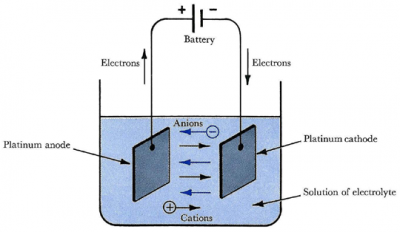 However, then ionic compounds are dissolved in water or melted into their liquid state, they possess mobile ions which have to tendency to carry electrons from one point to the other and hence, conducting electricity very effectively. The strength of electrolytes varies according to their composition and it affects the overall reaction process. Strong electrolytes are those which fully ionise in aqueous solution, completely dissociating into its respective ions and readily conducts electricity. Concentrated ionic solutions are generally very strong electrolytes because they have more number of mobile ions within them and electrons can easily be transported from one electrode to the other. 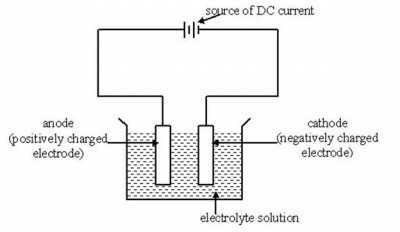 A weaker electrolyte is the one which do not fully dissociate in aqueous solution and most of its molecules remain combined, releasing merely few ions to the solution. The process of electric conduction is relatively slower in weak electrolytes due fewer numbers of mobile ions. Dilute ionic compounds are considered to be weak electrolytes. Ionic compounds exist in solid crystalline structure, held together by electrostatic forces between the oppositely charged ions. When dissolved in water, this structure breaks and positive and negatively charged ions are free to move within the liquid. Electrons from one electrode of the power supply are then carried by positively charged ions and transported to the oppositely charge electrode, hence, completing the electric circuit. 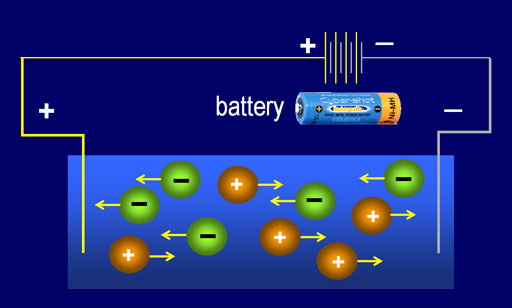 More concentrated the ionic solution, more number of ions will be present and it becomes easier to conduct electricity. Some ionic compounds have such strong electrostatic forces between their ions that even when dissolved in water, they recombine and only few ions are left mobile in the solution. Such solutions have lesser capacity to transport electrons and are said to be weak electrolytes. Diluted solution of ionic compounds form weak electrolytes, as they give away fewer number of moveable ions for conduction purpose.